Dimensions: 51 1/2 x 31 in. Note: Monogram and date appear in the lower right. The conceptual character of the painting is unusually clear. DGR here undertakes to consider the ambiguous signs that mark even the most beautiful and “many-gifted” things, not least of all his own art work. Pandora is one of those majestic female figures that begin to dominate DGR's major paintings from the mid-1860s. Some, like this painting, are cast from classical materials, others are more contemporary. In all, the idea of Beauty is brought forward to be interrogated in a variety of ways: as a cultural signifier and index of social and political conditions; as a touchstone of artistic practise; as an emblem of love and desire. The accompanying sonnet treats these ambiguities in an explicit way, but the painting is no less clear in its representations. The dark palette constructs an obscurity of colors that nicely supports the figural obscurities of the picture: the smoke-involved, barely visible “winged and fleshless passions” that so moved Swinburne; the lost gaze of Pandora; the closed casket, which may or may not still contain the hope signified in the myth (a hope that itself might or might not prove less fleeting or more substantial). DGR began studies for the picture in December 1868. It was completed in February 1871. In the fall of 1869 DGR thought of altering the picture from three-quarter to full-length, but he decided against the change. He made a chalk replica of this work for his regular patron William Graham in 1869 and in 1878 executed yet another version in colored crayons for his friend Watts Dunton. DGR's interest in photography can be traced through this painting, where Mrs. Morris assumes a pose that distinctly recalls one of the photographs that DGR and John Parsons made of her in 1865. The earliest response to the picture is Swinburne's enthusiastic notice published in his essay on DGR's work in the 1875 volume of Essays and Studies: “The design is among his mightiest in its godlike terror and imperial trouble of beauty, shadowed by the smoke and fiery vapour of winged and fleshless passions crowding around the casket in spires of flame-lit and curling cloud round her fatal face and mourning veil of hair” (90). The melancholy expression on Pandora's face is characteristic of the mythic female portraits he began to paint with Venus Verticordia. 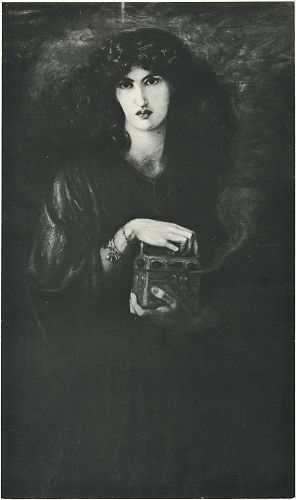 The smoke that issues from the box, enveloping Pandora, has been erotically interpreted by DGR, as Swinburne saw when he spoke of it as “the smoke and fiery vapour of winged and fleshless passions”. This smoke forms itself into a series of “potent spirits . . . escaping from the box” (Surtees I. 125); these spirit figures are more plainly visible in the later (1878) version DGR executed for Watts Dunton. 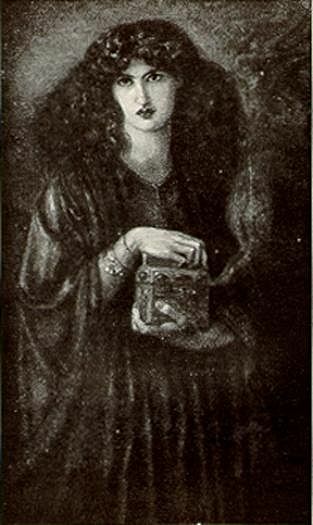 DGR copied Pandora's clenched hands, as well as her mournful expression, from one of the photographs he and John R. Parsons made of Jane Morris in the summer of 1865 in the garden at Cheyne Walk: Jane Morris, Standing in a Marquee. The importance DGR attached to the hands is underscored in the accompanying sonnet, where the hands appear at a signal moment in the text (line 12). The painting's most direct thematic relation is toVenus Verticordia, but equally relevant is the whole line of such dark prophetic female figures, through the late Mnemosyne, are represented in analogous ways. Twentieth-century critics sometimes find Swinburne's elaborate prose distasteful, but his remarks on this work are shrewd, not least for the political overtones they carry. Speaking of Pandora's “imperial trouble of beauty”, Swinburne calls attention to the socio-political meanings that invest DGR's late female portraits. Whatever we may think of them as expressions of DGR's psychic life, they are also indices of how DGR saw the imperial culture of late nineteenth-century England. As he was completing the picture in late 1869 DGR wrote the accompanying sonnet, which he published in the 1870 Poems . 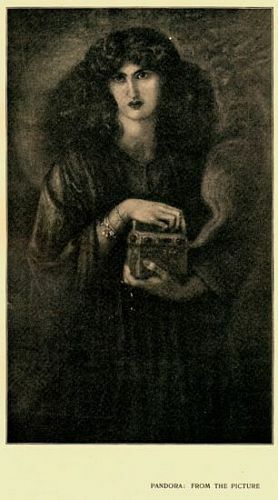 Pandora's name is Greek for “all gifted”, and the relevance of her mythological history for DGR's work is plain from Lemprière's account of her: “She was made from clay by Vulcan, at the request of Jupiter, who wished to punish the impiety and artifice of Prometheus by giving him a wife. When this woman of clay had been made by the artist . . . all the gods vied in making her presents. . . . Jupiter, after this, gave her a beautiful box which she was ordered to present to the man who married her; and by the commission of the god, Mercury conducted her to Prometheus. The artful mortal was sensible of the deceit and . . . he sent away Pandora. . . . His brother Epimetheus . . . married Pandora, and when he opened the box which she presented to him, there issued from it a multitude of evils and distempers which dispersed themselves all over the world. . . . Hope was the only one who remained at the bottom of the box, and it is she alone who has the wonderful power of easing the labours of man, and of rendering his troubles and sorrows less painful in life”. 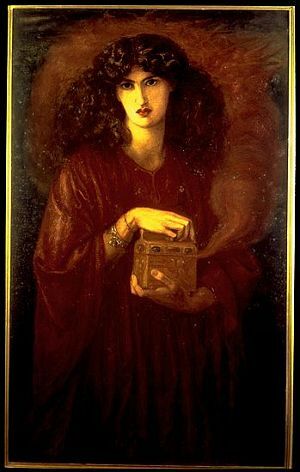 The inscription “Nescitur ignescitur” appears on the front of Pandora's box. In the version DGR executed for Watts Dunton the inscription is “Ultima manet spes”. The spirit-figures formed in the smoke issuing from the box recall the mournful figures of the Willowwood sonnets, as well as the “Vain Virtues” of the Vain Virtues sonnet. The latter was written at the same time as DGR's Pandora sonnet. It is difficult not to see in the painting DGR's meditation on the fatalities of his own life, most especially the unhappy complications that grew around his loves and friendships. This aspect of the picture is underscored by the accompanying sonnet. Angeli, DGR con 107 illustrazioni , 25. 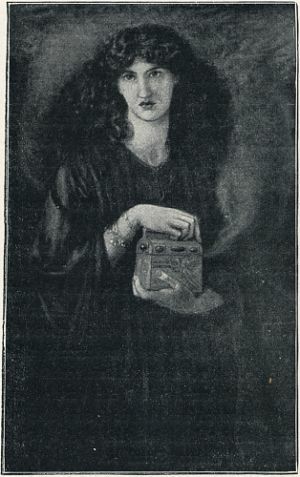 Bartram, “The Pre-Raphaelite Camera”, 135-139. DGR 1828-1882: An Exhibition (Tokyo 1990), 103. Marillier, DGR: An Illustrated Memorial , 163-164. WMR, DGR as Designer and Writer , 65. Sharp (Fiona Macleod), DGR: A Record and a Study, 211-212. Stephens, Dante Gabriel Rossetti , 75-77. Surtees, Catalogue Raisonné , vol. 1, 125 (no. 224). Surtees, Catalogue Raisonné , vol. 2, plate 318. Marillier, DGR: An Illustrated Memorial , facing page 162. Gowans and Gray, Masterpieces of Rossetti , 44. Delaware Art Museum print, Bancroft Collection.